Credit: Image created by Scixel (http://scixel.es/), under the instructions of D. Luque and P. J. de Pablo. "The complete particle of rotavirus is formed by three independent protein shells. 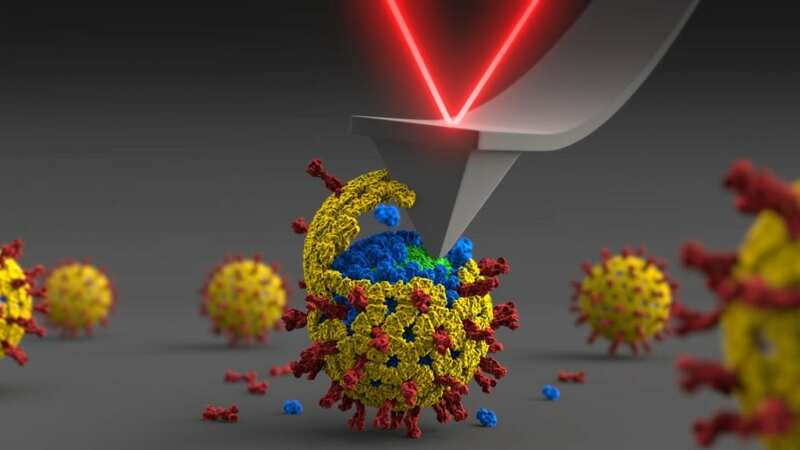 This particle and the subviral particles containing one or two protein layers play distinct roles during infection," explains lead author Manuel Jiménez-Zaragoza, Research Assistant in the Department of Physics of Condensed Matter at the Autonomous University of Madrid. "We wanted to see how the interactions between the layers that define these different particles work together during the virus replication cycle." "Our findings reveal how the biophysical properties of the three protein shells are fine-tuned to enable rotavirus to be carried among host cells," says senior author Pedro de Pablo, Associate Professor at the Autonomous University of Madrid. "We believe this could prove valuable in offering new venues for the development of novel antiviral strategies." The paper 'Biophysical properties of single rotavirus particles account for the functions of protein shells in a multilayered virus' can be freely accessed online at https://doi.org/10.7554/eLife.37295. Contents, including text, figures and data, are free to reuse under a CC BY 4.0 license. To view the latest Physics of Living Systems research published in eLife, visit https://elifesciences.org/subjects/physics-living-systems.